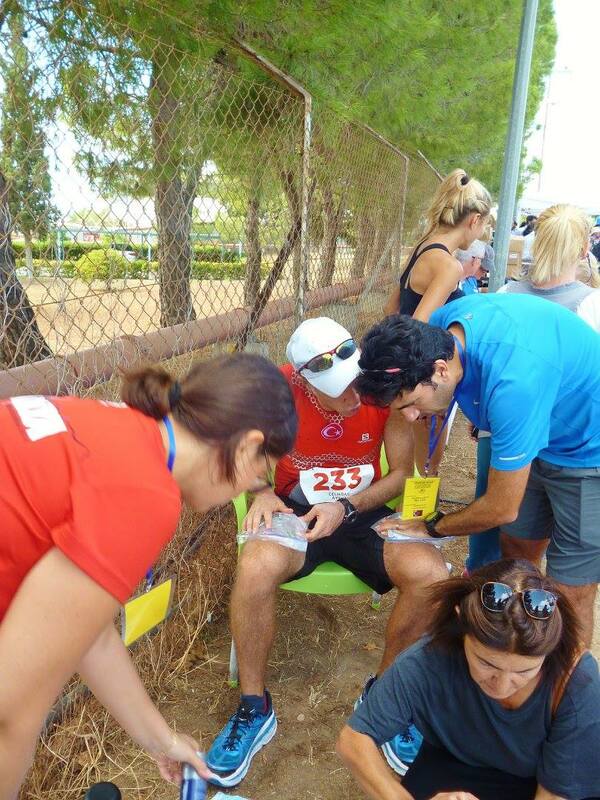 You see, last year I ran Spartathlon for the first time and finished in 33:47. My first goal was to finish and then to go below under 34 hours, if possible. So, it seems like everything went according to plan, right? Actually, the numbers don't tell the whole story. 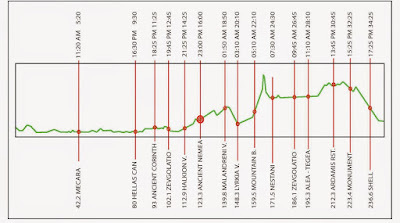 As I mentioned in last year's race report, everything started to go south after 80K. The last 24 hours were a tremendous struggle. I was constantly on the ropes, taking punches and getting knocked down. All I could do was to get up again and again. In the end, I guess the race got tired of beating me and it just let me finish. After last year's race there were two options for me. One of them was not coming back. Since I finished it, this was the easy and maybe also the sensible choice. The second option was to go back and try to prove myself that this wasn't a one time thing and that I could do it again. I always tell people that luck doesn't play a big part in this sport and you get what you put into it. But to be honest, I wasn't completely sure about this one. I really had a tough race last year and I kept thinking about whether I had the guts to do it again. As always there was only one way to find out. And one of the great things in this sport is that it lets me face the demons in my head. This was a great opportunity for sure. We can make people believe in certain things but can we really convince ourselves? I think that's the main question. After making that decision, I needed to be sure of my physical condition. I had a hernia operation and couldn't run in the first few months of the year. A 130K race was going to be my first real race after the operation and I was going to make a decision according to that result. When I was leaving home for the race, I got a big envelope coming from Athens. It was the 2014 Spartathlon DVD. It was of course nothing more than a coincidence but in the end, I and all the people in my support crew had very good races. 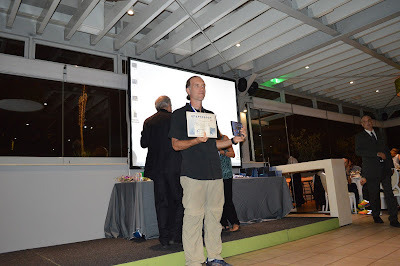 So I chose to take it as a sign from the Greek Gods and finalized my Spartathlon participation. My training during the summer months mostly went well but I took a really bad fall during a Sky Trail race in August. I got a few stitches in my face and knee but the real problem was the inflammation on my chest which took several weeks to heal. It finally got better and I decided that it wouldn't be an issue. Elevation Profile with crew access points. I got to Athens on Tuesday. 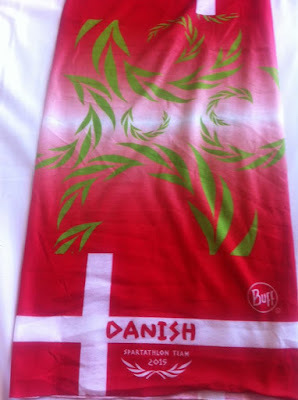 My roommate for this year's race was Palle from the Denmark team. We had a lot of similarities with Palle. 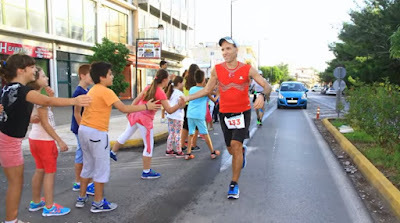 Just like me, he first ran and finished Spartathlon in 2014, said "never again" and of course didn't keep his promise and came back. One thing you absolutely don't need prior to a race of this magnitude is negativity and Palle is one of the most positive people you can find. When we were talking on Wednesday I asked him what would make him stop in this race. He, of course, told me that he would never think of stopping in this race, the race can stop him and he'd be OK with it but he would never stop no matter what. And that's exactly my thinking. He truly understands what it takes to finish this race and I was lucky to have him as my roommate. 2015 Spartathlon Team Denmark was kind enough to present one of their teams buffs to me. I'll wear it with great pride. After a short run on Wednesday morning, I went to the registration and saw a lot of familiar faces. Then we had the last meetings with my crew on Thursday and attended the race briefing. We had a lot of experience from last year so I'd say this year things were a lot less stressful. Friday, 4:30 am. My alarm goes off but we are already awake. This year I was able to sleep almost for 5 hours which is great for me. It's more than twice compared to last year. I have some breakfast while observing the nutrition myths collapse. Carbs, no carbs, fat, no fat, coffee, no coffee, only yoghurt etc. These guys are some of the best runners from their countries and everybody has a different approach to prerace nutrition. It just shows that there's no magic way, no silver bullet. You just have to find what it works for you and that's all. The busses take the runners to Acropolis and it's 6:30 in the blink of an eye. We take a few photos with my crew and talk about the last minute stuff. My brother Aytug and my friend Suna will support me just as last year, along with my brother's wife Melike. Crewing in this race is a serious business and it'll definitely be a tough 36 hours for them, too. I tell them that I need to go to the bathroom but in fact I just need a few minutes of quiet time alone. I go up a little at the Acropolis and look at the road ahead as it starts to get light. I have the greatest respect for this course. There are some questions and concerns in my head but I'm not scared. I remind myself that I had waited for a full year to face these concerns and no matter what happens it'll be a great battle. I'm well aware that I'd take a lot of punches and I'll get knocked down at least a few times. All I need to do is get up and continue like last year. I repeat Babe Ruth's quote in my head a few times: "It's hard to beat a man who NEVER gives up". Yes, I'm determined to make the course's job as hard as possible. With Aytuğ, Melike, Suna just before the start. The race starts at 7 am sharp. Even if you run this race just once, the experience helps. Descending the cobblestones and going into the busy streets of Athens, everything seems quite familiar. The biggest difference is that it will be much hotter and humid this year, at least for the first day. Even though we run at an easy pace I start to sweat early. But I'm quite ready for these kinds of conditions and it doesn't concern me just yet. The first 15K goes smoothly. I chat briefly with the people I know from last year. After a while someone turns back and shakes my hand saying that he'd read my 2014 race report and it was very helpful for him. This happens quite a few times before and during the race and I'm surprised to see that people know me. I learn that he's Nikos Petropoulos, one of the top Greek ultrarunners who would go on to finish under 28 hours as the fastest Greek. We run for 15 minutes, Nikos picks ups the pace and I wisely continue at my own pace. 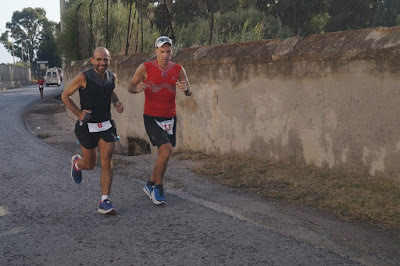 With Nikos, around 25th kilometer. School children are out to cheer for us. School children are out to cheer for us at the half marathon point. I run the first marathon in 3:45, just like last year. No need to stop here, just a quick water refill and I continue. Last year we had some heavy rain at this point but now it's getting quite hot. I take short walking breaks on the uphills in order not to increase my heart rate. 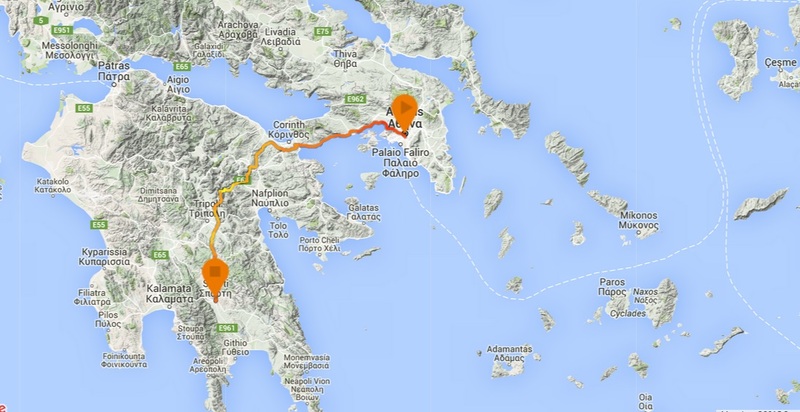 I planned that 8 hours for the first 80K would be more than enough which is 1.5 hours faster than the cut-off at Corinth. The crew having fun in the first section. A quick pit stop after the first marathon. From 50K to 65K, it's a tough section for me psychologically. This happened last year, too. You still have some work to do until the 80K, there's not much shade and the heat starts to really bother you. Since listening to music is not allowed in this race, I came up with a plan this year. I wrote some quotes on cards and asked my crew to present a random one when they see me at the crew access points. I thought this would help me to occupy my mind at least for a while. Now I look at one of the cards which has a quote from Bruce Lee and it reads "Do not pray for an easy life, pray for the strength to endure a difficult one." 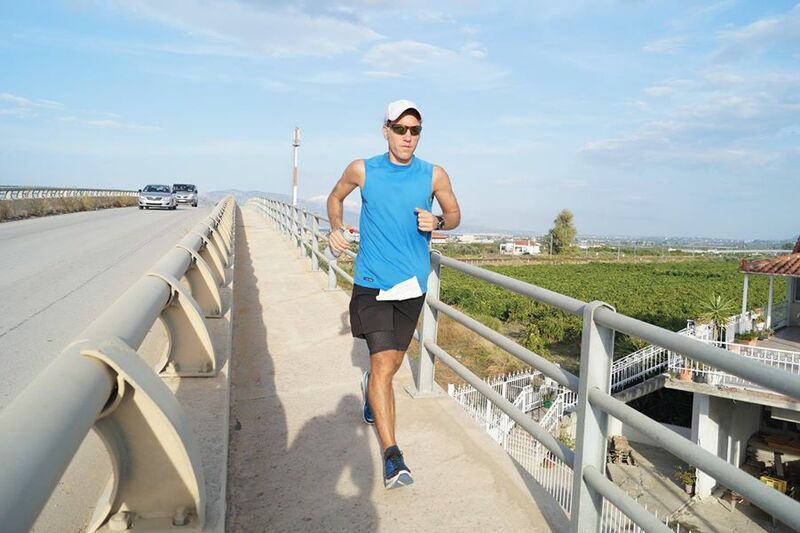 After a mentally challenging 40 minutes I run through the Corinth Canal at the 77th kilometer and then reach the 80K CP in 7:47. It's 2 minutes slower than last year but certainly better considering the hotter conditions. More importantly, I feel much better this year as my quads are not shot like the last time. After a quick toilet stop, I have some soup and rice. 2 marathons down, 4 to go. Now the race gets quieter when we get to the rural roads. It's 3pm in the afternoon and I take sponge baths at each CP. We still have 2-3 hours until it cools down and then it'll all be OK. I pass the 100K mark at 10:17. In most races, reaching triple digits normally boosts the morale as you start to smell the barn but I guess this is not one of those races. It's not even half way yet and I try not to think about it. I guess this is somewhere between 100 and 110K. I reach out my hand and say, "We haven't met before but it's an honor to meet you". Shaking hands, he says "I remember you; you are the Turkish guy from last year, right?" 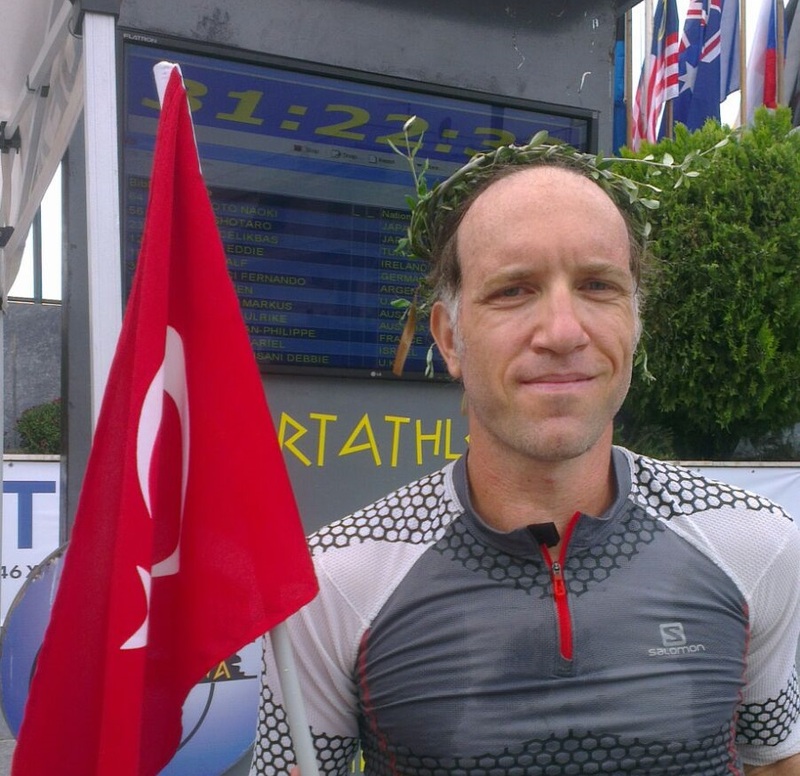 For those who don't know, Seppo Leinonen is a true Spartathlon legend with 15 finishes. He's here this year to support another Finnish runner. I thank him, get my headlamp and meet my crew. When I'm eating a few things Seppo comes back and tells me that I'm doing great in terms of time and provides some tips about the next section. We take advantage of this moment to have a picture. We'll see Seppo a few more times until the end of the race and he'll always provide encouragement and valuable tips. We now have a legend in the crew! I feel good leaving the station. I kept reminding myself to be calmer this year without looking at the watch every 30 seconds or so likeI did last year. I'm doing pretty good on that. I only remember my times at major points from last year so that I can have a better understanding of my race. (42k -3:45, 80K - 7:45, 123K - 13:45, 160K - 19:55, 200K - 27:10). But it doesn't mean everything's going great, either. Even though I drink a lot of water since the beginning of the race, I only pissed once and my stomach doesn't feel right. I don't want to eat anything and it's getting harder to process what I eat. As it gets dark, I'm running a gentle uphill. We see a full moon for a brief period of time and then it starts to get cloudy. We've been warned at the briefing by the president that it might rain in the evening but I didn't think it was going to be that serious as I was more concerned about the heat. Anyway, I'll deal with that later. I reach the half way point at 13:20 which is 25 minutes faster than last year. This was the easier half with more flat sections; the second part will be hilly. My legs are still fine but my stomach is quickly going south. I need to think about the reasons after the race but now I have to find a way to fix it. The section from 123k to 140K feels quite hard for me. I chat briefly with Sharon from Scotland but when she stops for a minute I continue. It was good to talk with someone after the lonely hours but if you want to finish this race you need to run your own race. The last downhill kilometers before Malendreni Village CP (140K) is tough on my legs. Somehow I don't remember this section very well from last year. I guess knowing the course has its advantages for sure but it cuts both ways. If things are not going good and you feel bad then your mind remembers all the hard parts in the upcoming sections. And it gets harder to continue when you know you'll suffer more. Much more. 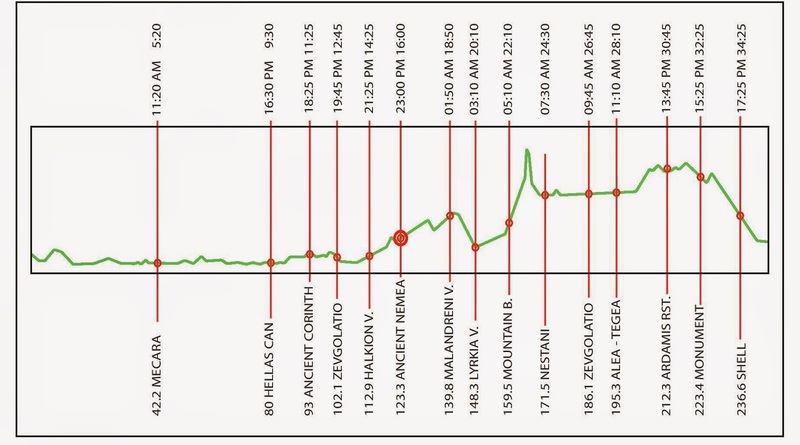 I lose almost 20-25 minutes in Malandreni just like the Ancient Nemea CP (123K). I can feel that my crew is getting anxious but I need to take longer breaks to settle my stomach. I can only eat some bread and cheese with coke which is not helping at all. Other than that it's just a waste of a lot of minutes. It's always funny how fast the time passes when you sit down. 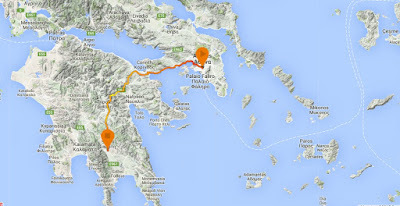 After the Lyrkia CP at the 149K mark, the course goes uphill. This is the place I feel the worst in the whole race. It's like someone is drilling my stomach. I can't eat anything for hours, my energy levels are down and I'm getting very sleepy. I don't want to start the climb in this condition so I get a massage on my quads while waiting for the stomach to settle. When I'm leaving the CP, I'm thinking that this would now be as hard as the last year. My crew would tell me later that they had thought of the same thing and that they get ready for a 35+ hour race. Suna gives me another card with my quotes which is the famous Ann Trason one: "It never always gets worse". Good job Suna, that's exactly what I need to hear at this point. I know at some point it'll get better. Or at least it won't get any worse. I just need to wait patiently. My legs are fine, I just need to hold on. Tough hours with a bad stomach. Wasting a lot of time by doing nothing. I guess, it's always the darkest before it gets light. I hike the whole road up to the 160K CP just like last year. You can definitely run it if you have the energy but to me it's not worth it when I still have a 100K to go in this condition. I reach the Mountain Base in 19:22 which is half an hour faster than last year. Now it gets windy and cold. Last year I wasted almost 50 minutes in this CP. This year I tell my crew that I'll leave in 10 minutes at most. I put on warm clothes and glance at my watch. If I leave in 5 minutes I'll be about one hour faster than last year. Of course, I'm sure you know by now that things rarely go according to plan in this race. As I take a few sips from the soup, I start throwing up. I throw up three more times in the next few minutes. Deja vu. I've puked only twice in all the races I've ran and both of them happened in this race, in this same section. I suddenly have no energy at all but at least my stomach feels better. I take some bread and cheese with me to eat at the top as the rain starts to fall. Mountain Base, 160K. In just a moment, I'll take a few sips from that soup and throw up four times. Last year, I didn't think the climb was that long. This year my legs are definitely better but I have trouble climbing up with an empty stomach. I even stop a few times to catch my breath. I already made my decision. I'll reach Nestani at 172K and try to sleep for 25 minutes. I don't want to run the last 80K like a zombie this year. The summit is almost 1200 meters up from the sea level. The rain with the wind has a chilling effect which I think is magnified because of my empty stomach. I don't want to stop at the top but I know there's a runnable section until Nestani. I need to run to get warm and I need calories to run. Two cups of coke with a small bar and I start to go down in the mist. Most people are walking but I can run this downhill quite well. There's another guy who can run pretty well so we go down together really quickly. When we finally reach the road again I learn that he's Thanasis from Greece. He's a great guy and we talk about a lot of things. And at the same time we run almost all the way until Nestani except for the few short uphill sections. I'm now 3 hours ahead of the cut-off and determined to sleep here for some time as I have spent all of my energy. I first eat some pasta and potatoes and then lie down but when your body works in overdrive for 20+ hours, it's hard to shut it down with just one button. I can't go to sleep for 25 minutes but at least I get some rest by closing my eyes. I lose almost 40 minutes here but I don't care. I have enough time and I'm not stressed at all. With Thanasis just before Nestani. No, we haven't seen a ghost or something. We're just really tired, that's all. When I'm leaving the CP I glance at my watch. It's 5:10 in the morning and we have about 1.5 hours until it gets light. Now there's a long flat section for almost 25 km and then we'll have the long gradual climb from 198K to 203K. I want to make up some time on this flat section. I also have to run because I got cold while lying down. My legs still feel relatively OK but I can't say the same thing for my toes and nails. I run all the way to the 186K checkpoint with minimum walking breaks and I'm still about 2:45 over the cut-offs. It's been 24 hours since the start and it finally gets light. I have 60K to go but the difference from last year is that I'm very relaxed and my confidence grows with every kilometer. I'm on pace to finish in 8 to 11 hours. Yes, it's still a long way to go but this year I know I'll finish if I keep on moving which takes a big weight off my shoulders. This relaxed approach also helps my communication with the crew. Last year I was running in a bubble, this time it's much different. New day, new hopes. I'm running well and everyone's happy. The 5K uphill section starts at 198K. I power hike most of this climb. I pass the 200K mark at 26:05 which is one hour faster than last year. But the more important thing is I feel much better physically and psychologically. I knew a lot about the race even before running it last year as I read and watched everything about it. Still, it was like diving into the abyss. This time I really know what awaits me. I'm prepared for the physical pain and the mental struggle. At the end of the climb I notice a familiar face. It's Thanasis who we got separated at Nestani. To be honest, he doesn't look good. He says his quads are shot and he just can't run anymore. I know what's going on in his head, I was exactly in his shoes last year. I tell him the truth and nothing but the truth: "It's not going to be easy. Actually, it's going to hurt a lot but you have so much time left and if you don't stop you'll finish for sure. And when you finish, everything will be worth it." He promises to go until the end and we shake hands to see each other in Sparta. 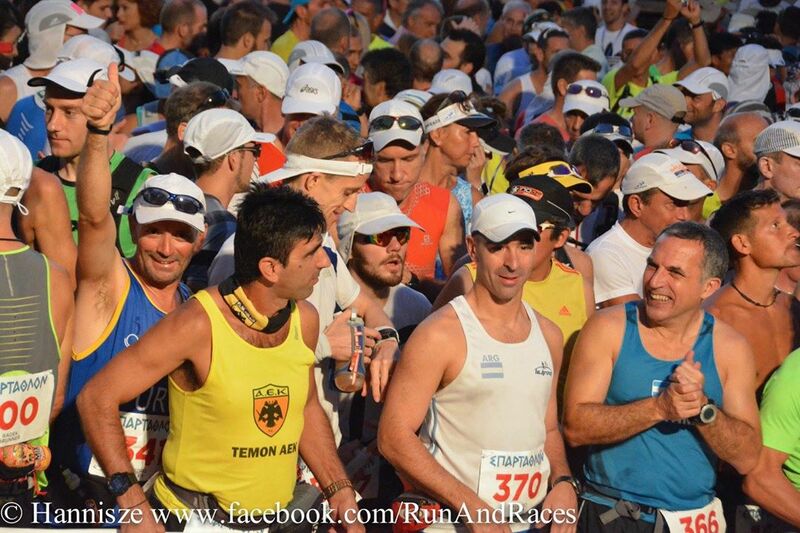 I run well for a few kilometers and then I see Andrei who is most likely the biggest Spartathlon ambassador in the US. He's running for his third consecutive finish. I ask him if it's OK if I try to run with him for some time. He says sure and off we go. He is someone who has finished more than 20 consecutive 100+ mile races with his `never quit` attitude. 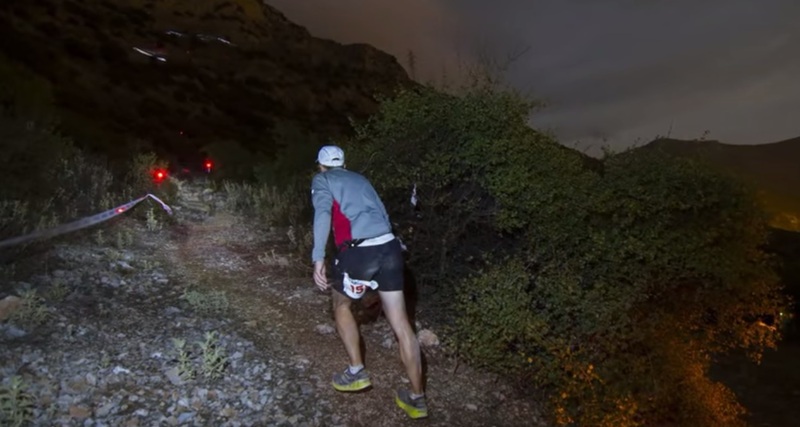 I'd say that's the type of person you want to run the last section of this race with. We run all the descents and flat sections at a respectable pace while talking about a lot of stuff. Last year I had the worst imaginable quad pain I've ever experienced in this section and couldn't run more than a few hundred meters without stopping. This time I almost enjoy some of it. Well, I don't know if "enjoying" is the right verb for that sensation but at this point of time if you can take a step without hating the whole world then I guess it's quite enjoyable. My stomach is not great but not terrible either. The only stuff I eat in the last 50K are coke, some bread, a small bar and a cup of soup. Who knows, maybe I should keep things as simple as possible. It's now 15 or 16k to go and I look at my watch. I calculate that if I can run the last part under 95 minutes then I can go below 31:30 which would be almost a 2.5 hour improvement from last year. I tell this to Andrei who's having big stomach problems of his own. I want to give it a go when I have the opportunity. We shake hands and I try to go faster at a sustainable pace. A few kilometers later I notice another Spartathlon legend, Malinowsky from Poland who's going for his 12th finish. I try to keep up with him for some time and when he's having a walking break I continue on my own. I'll learn later that I ran the 10K section from 233 to 243K in 52 minutes which includes a shirt range and two stops for coke at the CPs. Yes, it's downhill and it may not look very impressive to you but if you'll excuse me I may declare it as my best 10K performance! Checkpoint 72. Two more of these and the third one is King Leonidas! After what I went through last year, to be able to run this last section is total redemption for me. A few moments later I spot the "Sparti 4km" sign ahead. I run hard for another kilometer and finally believe that I can now easily go under 31:30. I tell myself to relax and enjoy the last few kilometers. After all the hard work the best part is about to come. I pat myself on the back, somehow I did it again. 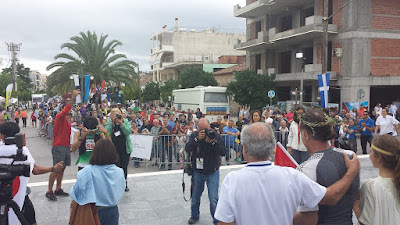 The kids on their bikes guide me through the busy streets of Sparta while people cheer for us. Turn right, go for 650 meters and turn right again. Then you have the greatest 500 meters of road ahead of you. I get my flag from my brother and run the last steps to deliver the message. I just can't describe that feeling, you'll understand what it feels like when you get there. (or just watch the video at the bottom which gives a good idea). Getting congratulated by a legend. 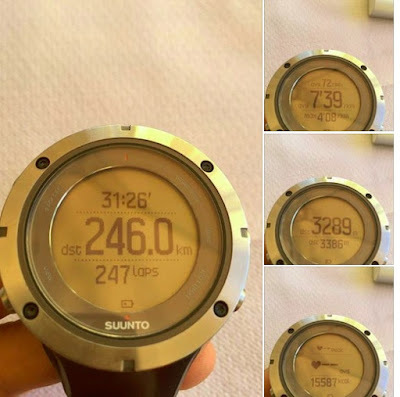 Suunto Ambit 3 Peak, one second recording. Used a portable charger twice for 4o minutes each while running. My legs were relatively good after the race but my toes and nails were as if they had gone through a meat grinder. That's actually a very small price to pay. I had to lie down for some time for my stomach to settle and then I got better. I took a quick shower at the hotel and went to a restaurant by the finish with my brother. Since half of the finishers come between 17:00 and 19:00, I was able to witness the finish of a lot of friends and familiar faces including my roommate Palle. I somehow missed him at the finish when I went to the bathroom but Thanasis who looked really bad at 205k also kept his promise and finished under 35 hours. I was able to see and congratulate him on Monday night at the dinner. The race ends on Saturday evening but the celebrations go on for two more days. 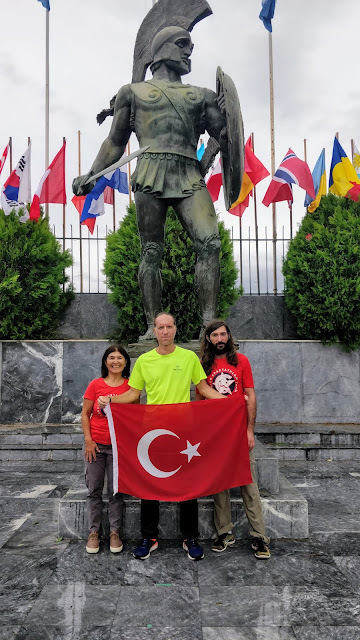 We had the lunch in Sparta on Sunday and went to a great location for the official awards dinner where all the finishers got their medals and certificates. With three time Spartathlon winner Ivan Cudin. When I look back at my race, I can say that I sticked to my plan and didn't go faster than last year. Actually, the first 80K was the same. I was 25 minutes faster at the half point and one hour faster at 200K. After suffering with stomach problems through the night, I got much better in the morning and actually ran the last 50K quite well. In the end, it was 2.5 hours faster than last year which was something I never dreamed of. Dealing with the stomach problems in the second 80K was tough. I need to think about the reasons and find some solutions. I know some of this stuff may be unavoidable but it doesn't mean I won't try to fix it. That's part of the fun, right? The below graph shows my position in various checkpoints. I think it summarizes quite well what I actually experienced in the race. A stable 80K followed by a section which went from bad to worse. Things then started to get better after Nestani (172K) and I was able to make a lot of time in the last 50K. Considering the quality of this field, it may very well be my strongest finish. My race position at the chip timing points. Here's the Strava link of the whole race. I'm really glad that I was able to prove myself that I can finish this race once again. I wouldn't say it was easier but I was much more relaxed and prepared for the physical and mental struggles. The thing is when you come back to this race everything starts from zero and it doesn't care about who you are and how many times you finished. You need to have the mindset of an ancient warrior and if you show any sign of weakness it will chew you and spit out. But that's the beauty of it, right? That's why people come back year after year to test themselves. I'd like to take a moment to thank my great support crew who helped me throughout the race. This is a team effort and we did it together. 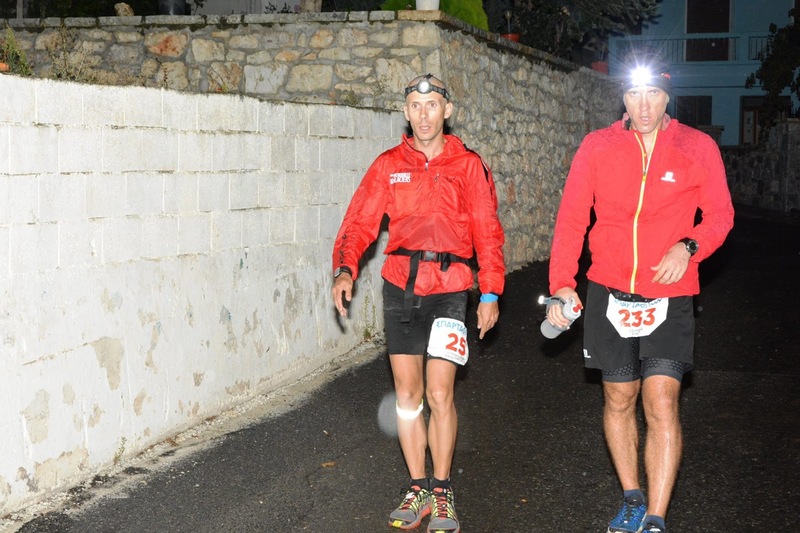 My brother and my friend Suna were here for a second straight year and they totaly understand the spirit of this race. I want to extend my gratitude to the great volunteers of this race who supported us with great care until the city of Sparta. 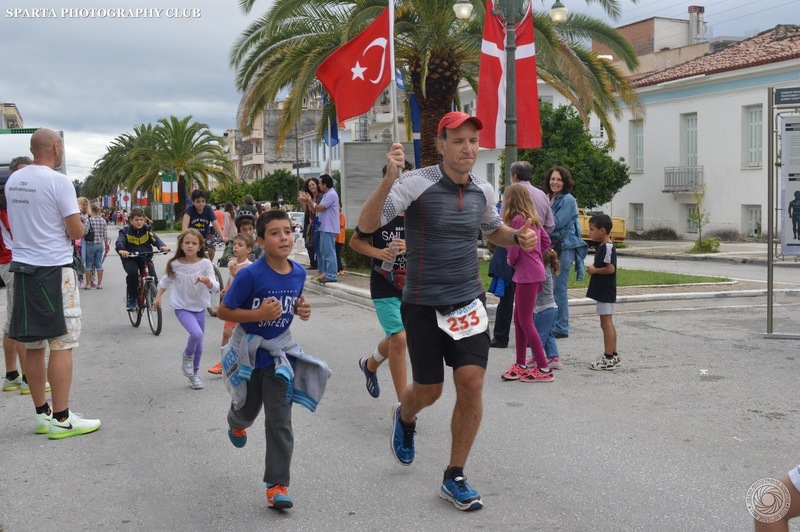 The Spartathlon organization committee is second to none and it's easy to see how much they work to keep this race close to its roots. Thank you for organizing another flawless race. Last but not least, I want to thank all of my fellow Spartathletes who I shared this journey with. No matter what the outcome I salute you all. So what about next year you ask, huh? Well, let's just not ask that question yet. But I'll tell you this for sure: This race has all the ingredients that I like about this sport and in the future I'd like to participate either as a runner, supporter or a volunteer for sure. It's just too good, too epic to be missed and that's all I'm going to say at this moment! I promise you everything will worth it in the end. Congratulations on a great performance. I had read your race report from last year but did not recognise you on the road, sorry! Considering that we were basically equal at 200k I find it astounding that you managed to finish 2 hours ahead of me. That's a superb finish, congratulations! Most of the night hours were quite tough for me and after Nestani I started to get better and better. So, unlike last year, I was able to run the last marathon quite well.